We’ve been helping our clients expand their presence with social media sites like Facebook. Through this, we have come across some very cool platforms, applications, and add-ons. One of the sites we like for the retail world is Polyvore.com. Clothing retailers and brands should be learning all they can about them and how to incorporate them into your site and social networking strategies. Look at their app for Facebook. Mix & match products from your favorite stores. Shop looks created by the web’s largest fashion community. What does the site do? Polyvore allows people to create “sets” of clothes from different brands. The user/designer of the set is then able to add the set to their blog, share the set with the Polyvore community, buy the products in the set, and in the end, develop followers of the designers of the sets. It’s like having a virtual changing room with all of your favorite clothes from different designers in one place allowing you to mix and match. Why should you be there? Thought leaders in fashion are engaging in the site. It’s primarily women right now. Who develops the sets? Individual fashion enthusiasts and brands alike. How to get involved? Contact us and we can help you out. You can also sign up via their site. Youth marketers want college kids to interact with their brand, to participate in something with them, and, ultimately, become a lifelong customer. What usually follows is a plan to build a contest around the chance to win a worthwhile prize by doing this, that, and the other. Brands hope that dangling a “cool” enough carrot in front of college kids will result in tons of them jumping through hoops for a chance to win it. What’s often lost in the planning process are some important considerations for increasing your own odds for success and participation. Remove the hurdles. Want to know how to get zero entries for your next sweepstakes or contest promotion? Ask people to sell out five of their “closest” friends’ names and emails. Ask entrants to commit to a trial subscription that they can cancel at any time. Or, how about this one: Ask them to sit through a seminar. Most customers are inherently lazy when it comes to entering contests. It’s not wrong to want them to perform an action to participate or earn their entry; just make sure the request is reasonable for what they might win. Also, give them multiple ways to enter. Make your prize attainable. Sometimes, an offer may seem too good to be true. If your contest prize is too grandiose, it may be ignored. People think, “I’ll never win this, so why bother?” Youth are fickle when it comes to contests and ploys for their attention. A good strategy is reallocate the budget for one large prize into groups of smaller, more attainable prizes. For college students, for instance, you could make your contest more localized (i.e., one prize per campus) to give the impression that they are in closer proximity to your brand and have better odds of winning. Make your prizes remarkable. The best things to win are the things you can’t go and buy. Think about offering something one-of-a-kind that only you can provide or using your power to arrange the experience of a lifetime. Think big. 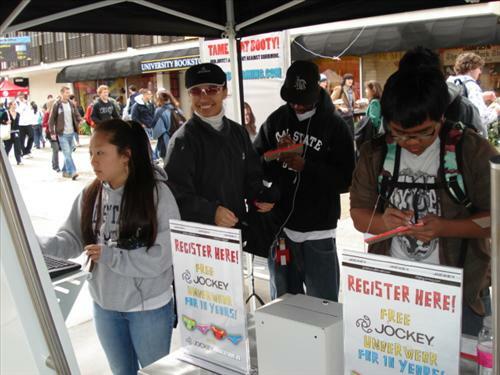 College kids won’t get excited about the chance to win an iPod or free movie tickets. They would, however, do unthinkable things to have lunch with Steve Jobs or play a bit part in a real Hollywood movie. Keep it on the up and up Don’t get cute with your terms, privacy statement, deadlines and restrictions. Be honest and up front about what you are doing, and announce your winner(s) in a very public way on the date you say you will. People want to know if they won, who won, etc. Let them know. This transparency helps ensure that you didn’t hand select your cousin’s kid as the winner. Promote it! A contest can rarely stand on its own. Unless the grand prize is completely unique it’s not going to “go viral.” Cultivating participation will take some advertising budget to get the word out. Remember, your passionate fans may not want to spread the word about your contest as a strategy to boost their odds of winning. Many college marketers are tasked with getting on campus to interact with students, press the flesh, and hype up their new product or service. Some fall into the trap of overthinking their execution and feel that a full-fledged event is in order. Not so. Well-timed, professionally executed “pocket promotions” can eliminate the need for full-scale campus events and tours. Designing tents, securing permits, and navigating other logistical hurdles can take months and cause you to miss an opportunity to be on campus right away. Pocket promotions work well when your timing is, well, timely. For example, a timely pocket promotion might be a beverage company handing out free product to a campus that has just won an NCAA championship. Small pocket promotions work even better when the promotion is part of a larger national campaign you are running. A hypothetical example of this might be Taco Bell dovetailing a late-night college bar promotion with the national release of a new menu item. Methods like this work because you are bringing an extension of your campaign into niche markets for direct impact. Understand that a pocket promotion is a short-lived event (just a few hours) promotion in a highly targeted area (on campus, at a beach, tailgating event, etc.) where, usually, a street team is interacting with a consumer one-on-one about something very specific with a mixture of some custom media. Maybe you are promoting a new movie release, or creating awareness about drunk driving. No matter what your message, it needs to be quick and to the point and offer an opportunity for people to walk away from your conversation understanding what you want them to do while encouraging them to share it with their friends. Minimal start-up: These types of promotions are nimble and can be created quickly to seize an opportunity. Expeditious: Doesn’t require months of planning or the need to secure permits. Portable: Can be picked up and moved to where your customers are. Economical: Staff models, management, product, and basic metrics are easy on the budget. Some simple guerilla media (wild postings, chalking, projection ads) also give it a fun feel. Scalable: If it works, you can get it up and running in other markets on a dime. PR: If your promotion is creative, ties in a great cause, delivers a cool message, or utilizes unique media, you are bound to get some press. Backlash: These pocket promotions are typically done ambush style. It may result in being asked to leave a location, fines, or complaints from citizens, depending on what you are doing. No one home: With proper scouting, you should be hitting the right places at a time when your customers are there. You always run the risk that they might not show up when you want them to. Short-lived: Not a good strategy if you need anything sustained. Engaging your customer in a more meaningful dialogue over time and building a relationship is always better than a here-and-gone approach. Inclement weather: Unless you are an umbrella company, rain will probably ruin your pocket promotion. Bad weather (rain, snow, bitter cold, etc.) can be a buzzkill and sometimes rescheduling just won’t work.